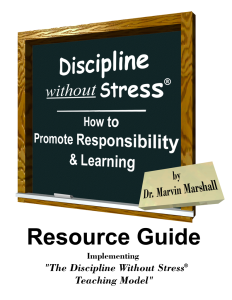 Why do you separate classroom management from discipline? The key to successful classroom management is to teach and practice procedures for everything the teacher wants the students to do. In essence, classroom management has to do with making instruction efficient—and this is the teacher’s responsibility. The more effective teacher’s classroom management, the fewer discipline problems will occur. On the other hand, discipline has to do with impulse control and is the student’s responsibility. A successful discipline approach attends to this challenge.